No scanners used here!! The check out girl is happy to help her customers purchase their canned goods and produce in this period illustration. 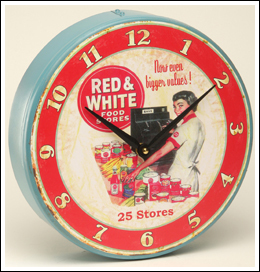 Finished to look like we just took it off the walls of the Red & White Food Stores, this 10” diameter clock (body is off-white rusted tin) will look fabulous on the walls of your retro kitchen. Quartz movement, uses one AA battery.